Supplementary material reads: "From news bureau. Pan American World Airways. Foto caption. Raw nwgs., pls develope [sic.]. Los Angeles' finest prepare to invade New York by air: Fifty members of the Los Angeles Police Department's American Legion Post #381 Band took off for New York City and the American Legion National Convention which will officially get under weigh Monday. 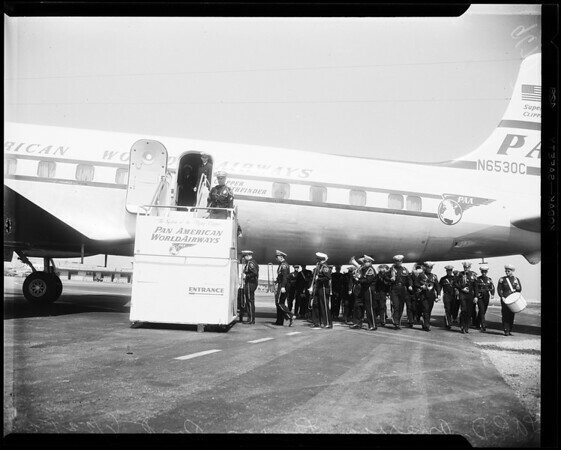 Under the guidance of Bandleader Officer J. Edmund Burr and Lt. Harry Engelund the fifty musically inclined gendarmes stowed away 880 pounds of instruments and made the trip, non-stop, from Los Angeles International Airport to Idlewild, New York on their chartered Pan American World Airways DC6B Rainbow Clipper. The Police band, which won the state championship in Fresno, will represent both the City and the State of California during the big convention parade Tuesday in New York. The band will return here Friday".